Large, scented magnolia trees covered the walls of each end of the house, whilst the sandstone pillars encompassing the aluminium and glass frontage of the Boardroom were covered in grapevines. Above the Boardroom was a flowering wisteria, and a small lead-covered balcony looked out over to Windsor Castle. Mr Noel Phillips, the head gardener, and his family lived in the small cottage at the east end of the property. He and his staff of two took great pride in the flower boarders of mixed white daisies. In July 1947 Sir Stafford Cripps, the then President of the board of Trade, formally opened The Fulmer Research Institute. The Opening was hosted by Fulmer’s Chairman, Colonel Devereux. 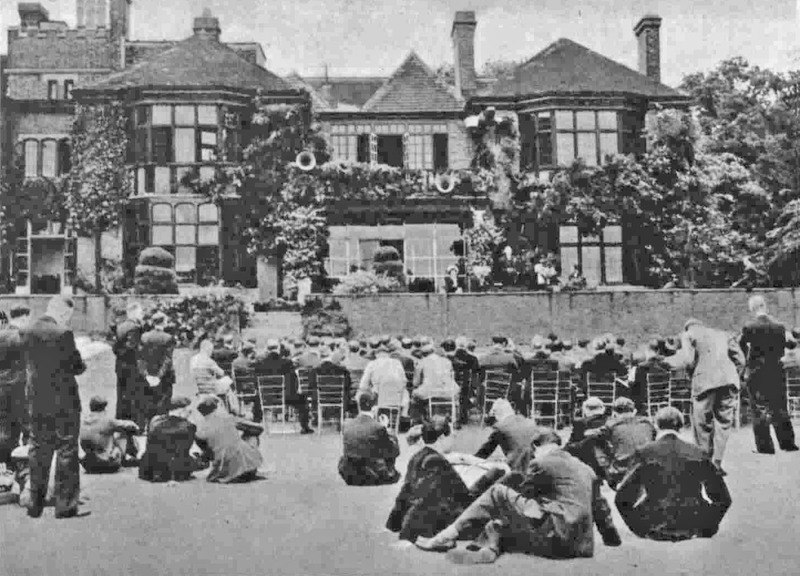 His guests of honour were many friends from the metallurgical industry who sat on the flagstone terrace while other guests sat on the lawn. The house itself was built of handmade bricks, with wooden frames with leaded light windows. 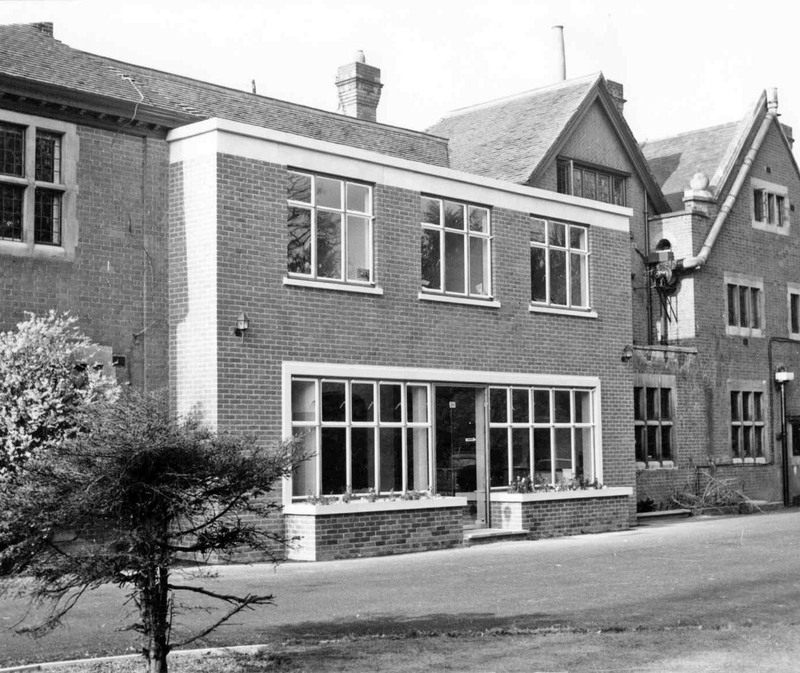 The exception was the newly-constructed aluminium and glass facade of the Boardroom (middle centre), that replaced the traditional materials in order to emphasise that the main reason for starting the laboratory was to develop new ways of aluminium production and research advanced aluminium alloys. 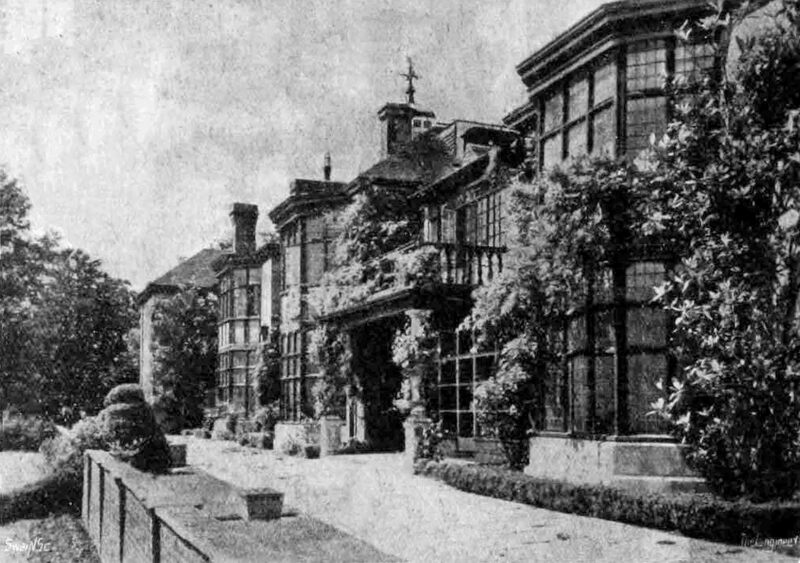 Although the original property was in Stoke Poges, the laboratory is named after the adjacent village of Fulmer; the suggestion is that the house had a Fulmer telephone number. Originally, the Mechanical Testing Laboratory was housed on the ground floor of the Main House. 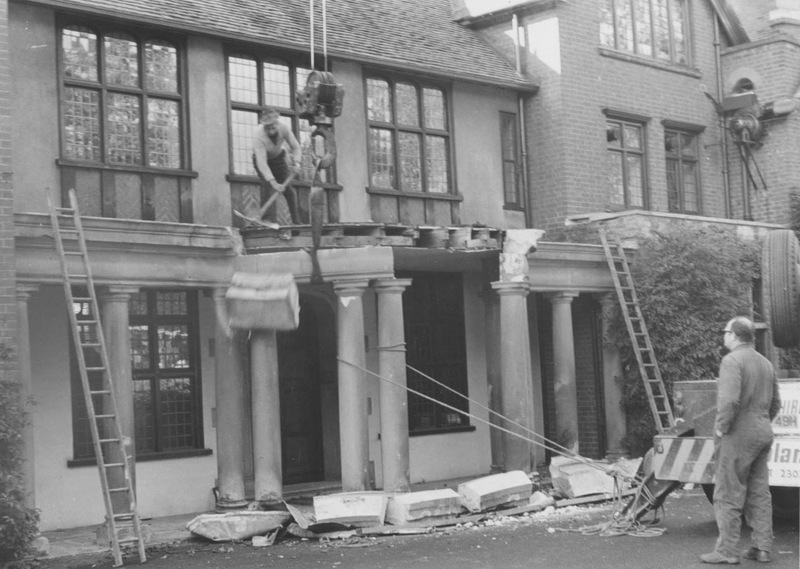 The original parquet floor was replaced by reinforced concrete to take the load of the heavy testing equipment. 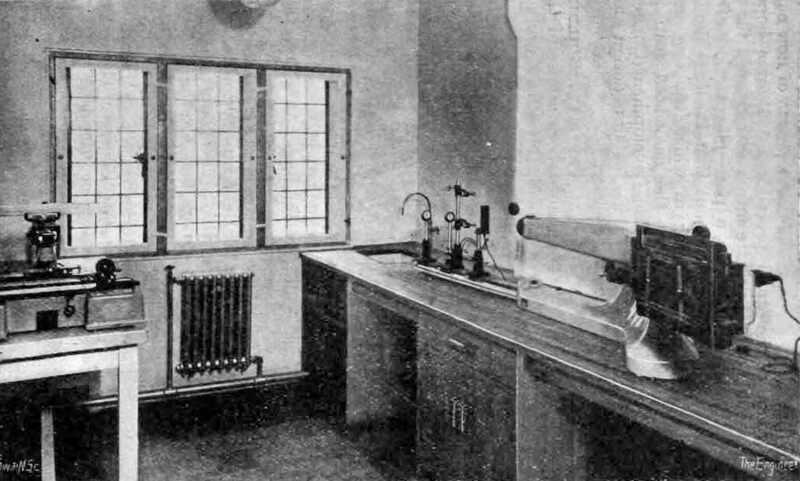 Another view of the Mechanical Testing Laboratory housed on the ground floor of the main house. Before the conversion of the original house this was a large reception room that faced directly south. The parquet flooring and leaded windows were architectural features. 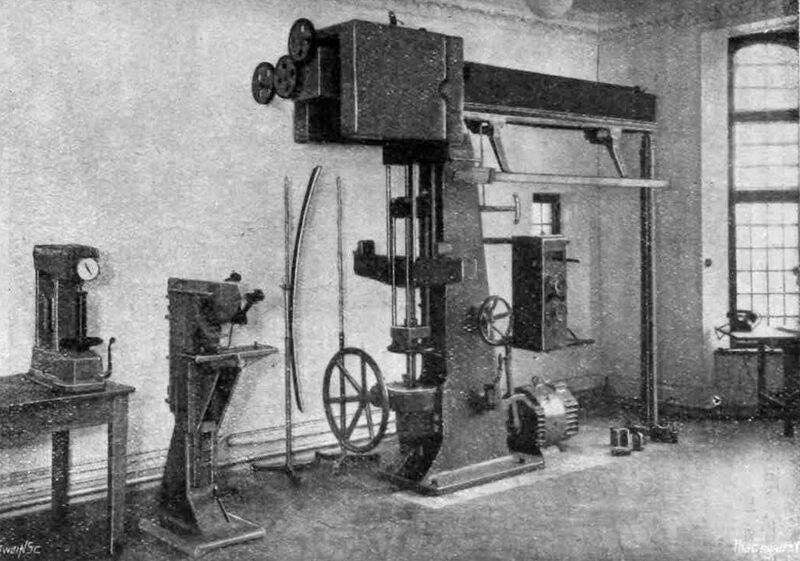 The Metallographic Examination Room was at the east end of the first floor. 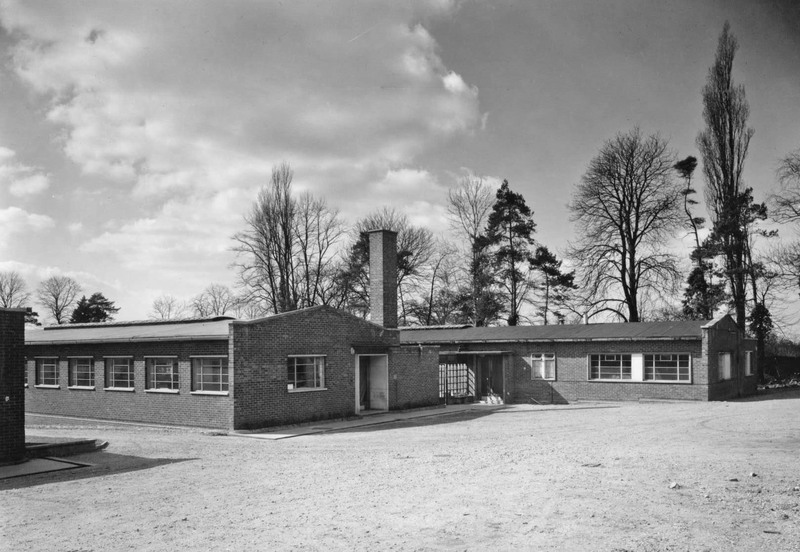 Dr Hardy, the head of the Metallurgy Section used the room on the north side of the house for his office and laboratory. The adjacent room was a preparation room for metallurgical specimens. 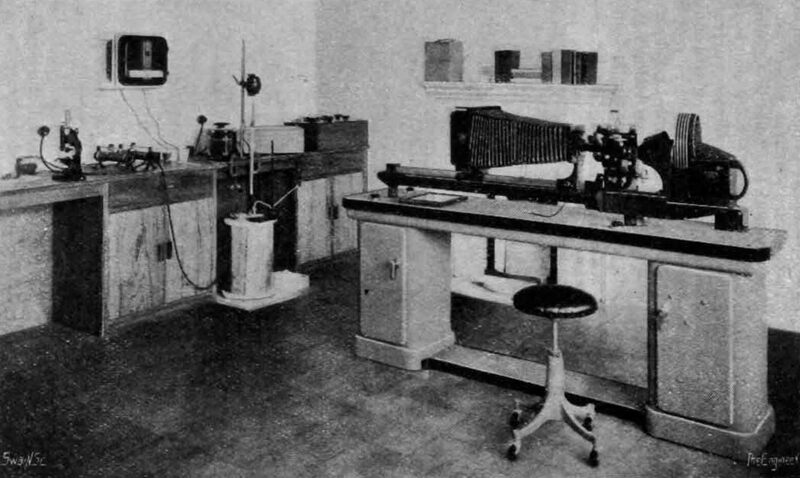 The Spectrographic Laboratory was housed in a small room facing south. On the right of the picture is the Hilger Spectrograph, showing the photographic plate assembly, the glass prism housing and specimen holder. 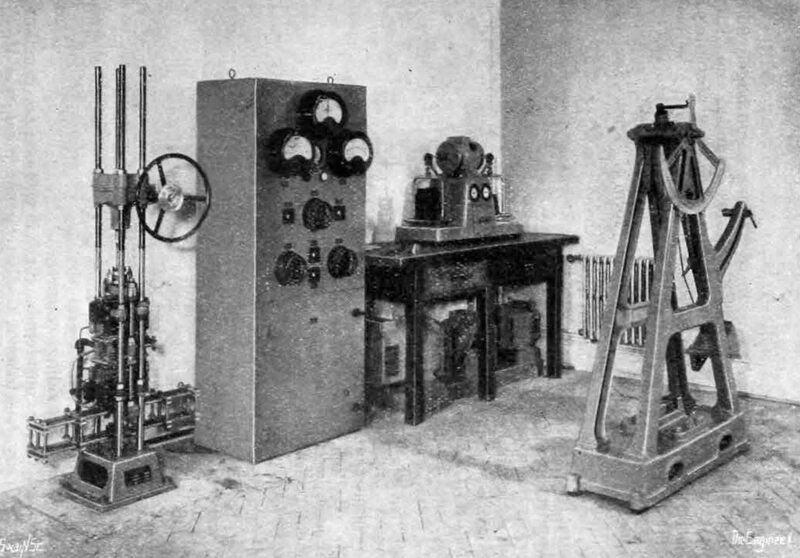 On the left of the picture is the spectrum plate analysis equipment later used by Doug Nicholas, the spectographer, to examine a number of paint samples associated with the 1963 Great Train Robbery, prior to him giving evidence in the trial. 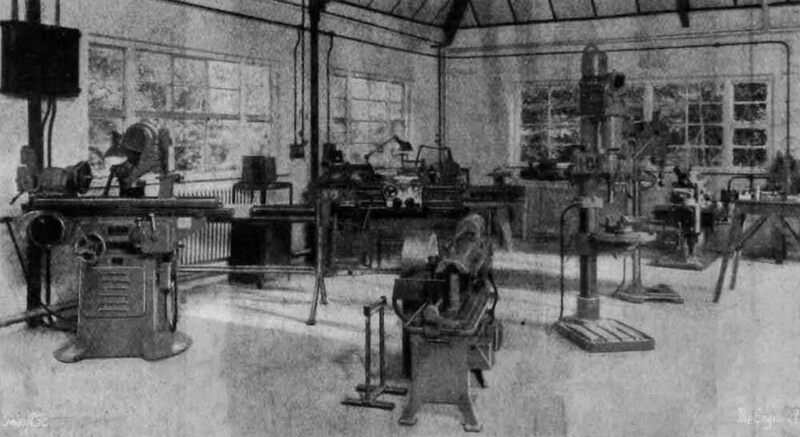 During the first phase of conversion of the House and development of the Fulmer Research site the Machine Workshop was housed in one section of the recently constructed Foundry Building. At that time the head of the Mechanical Testing Laboratory was Ken Mitchell. The lower section of the laboratory was operated by Malcolm Deighton and used for long-term creep measurements of nuclear construction materials. The head of the Metallurgical Laboratory was Dr Hardy and later Greville Brook. 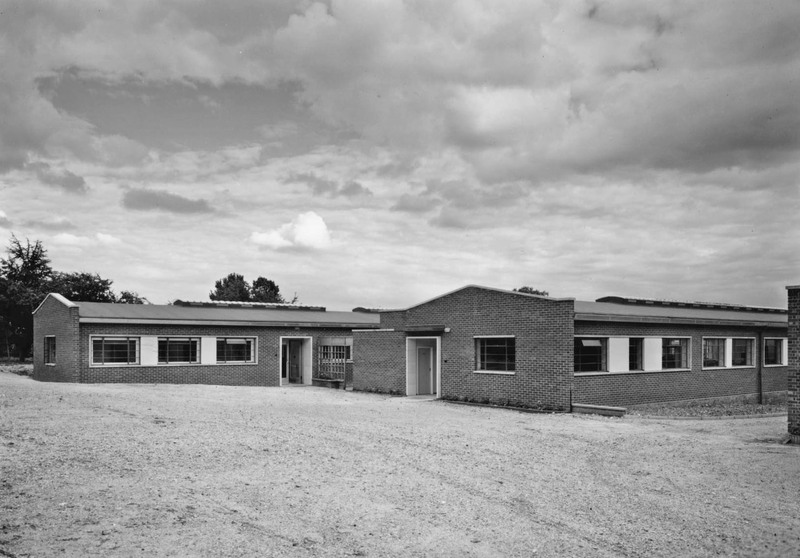 The building was first used as the staff canteen, but on later conversion used mostly for metallurgical preparations and analysis. 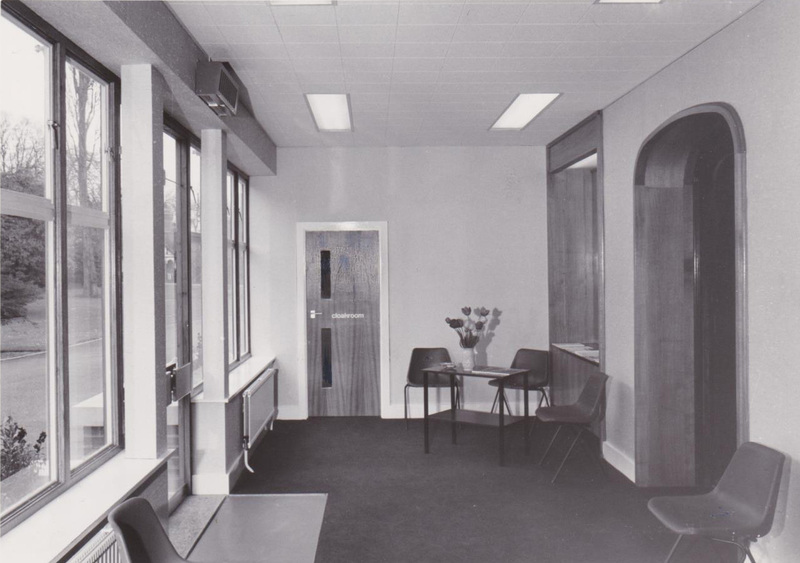 The interior was subsequently completely altered to accomodate offices, initially just on the length of one side. By the 1970s the cellar was used for ballistic testing of Kevlar sheet samples for bullet-proof armour. The Physics Laboratory was headed up by Dr G I Williams. To the left of the main entrance door was housed Fulmer’s first electron microscope and the room later became a laboratory for the ESA ion engine experiments. The workshop was first sited in a section of the original Foundry building (see above). When Dr Duckworth became Managing Director he was keen to improve the image of the Main House and the driveway. The front entrance originally comprised a half circle of open sandstone Tuscan columns on a flagstone base, which in turn led to two large wooden entrance doors. The builders were a small local company who were known by members of staff for private building projects. The two wooden doors remained and became integral with the new interior. The new entrance, with its brickwork facade and raised flowerbeds, comprised a reception area and allowed for a suite of administrative offices directly above. The picture also shows part of the new tarmac driveway which replaced a badly worn, gravel drive with numerous potholes. The adjacent reconstructed lawns surrounding the driveway were subsequently became a putting green. The glazed front door and windows, and carpeted floor lead directly onto the original arched wooden doors. These were kept permanently open to allow a view through to the Board Room, the terrace and the garden beyond. The entrance hall incoporated the reception desk as well as a toilet. Its interior did not reflect the essentially wooden interior and wooden floors of the Main House and even had flourescent lighting.